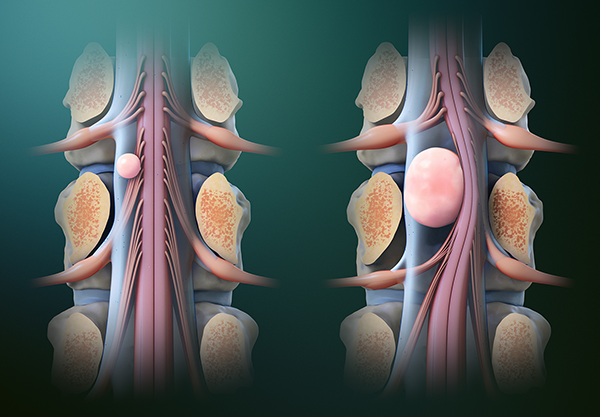 Minimally invasive spinal cord tumor removal surgery aims to safely and efficiently remove tumors from the spinal cord while maintaining the stability of the vertebral bones and spinal joints. As a spinal cord specialist, Dr. Luis M. Tumialán performs minimally-invasive spinal cord tumor removal surgery in Scottsdale, AZ, with a high degree of safety and effectiveness. The spinal cord is among the most delicate parts of the anatomy, and Dr. Tumialán can remove spinal cord tumors without harming the surrounding muscles, ligaments, nerves, and vertebrae. The nerves, discs, and vertebrae are located deep within the body. In the past, open surgery usedlong incisions to remove a spinal tumor resulted in the potential for instability. Patients who had successful resections of a spinal cord tumor would experience pain and disability in the years after the operation. At times this would result in scoliosis (curvature of the spine). Advanced techniques now allow surgeons to remove spinal tumors much less invasively. Using a minimally invasive approach, Dr. Tumialán places a small incision immediately over the lesion and with use of a minimal access port and an operating microscope can completely resect a lesion without destabilizing the spine. Patients experience minimal discomfort from a smaller incision and less tissue trauma. Dr. Tumialán always uses bone-sparing approach to maintain spine integrity. With this technique, Dr. Tumialán creates small holes in the bone to access the tumor instead of removing an extensive amount of bone from the spine. These methods are an alternative to more extensive procedures, and they can allow patients to avoid bone fusion with rods and screws. Wearing a postoperative brace is typically not required, and most patients can go home the day after surgery. ​​​​​​​Dr. Tumialán always uses bone-sparing approach to maintain spine integrity. With this technique, Dr. Tumialán creates small holes in the bone to access the tumor instead of removing an extensive amount of bone from the spine. These methods are an alternative to more extensive procedures, and they can allow patients to avoid bone fusion with rods and screws. Wearing a postoperative brace is typically not required, and most patients can go home the day after surgery. Spinal tumors may be located on the spinal cord itself, or they may be located in the spinal canal but outside of the spinal cord (spinal bone tumor). They may be cancerous or benign, and they may or may not require surgical removal. A highly skilled and qualified spinal cord surgeon such as Dr. Tumialán may use one or more tests including MRI, CT scan, and biopsy to provide a diagnosis. An MRI is a common form of diagnostic imaging. It produces three-dimensional images of the spine, nerve roots, and vertebrae by using strong magnets in conjunction with computer technology. An MRI can detect changes in the anatomical structure of tumors, as well as other growths or degeneration. A CT scan is very useful in detecting the shape and size of the spinal canal, which in turn can determine whether or not there is a growth or tumor inside. CT scans can also detect conditions such as calcium deposits and other bony structures. A biopsy is required to make a final diagnosis of a tumor. Your doctor takes a small tissue sample to be examined under a microscope. The results will define the type of tumor and guide the treatment options.